1. Click on Applications/Backtrack/Vulnerability assesment/Web Vulnerability assessment/CMS Vulnerability Identification/joomscan. 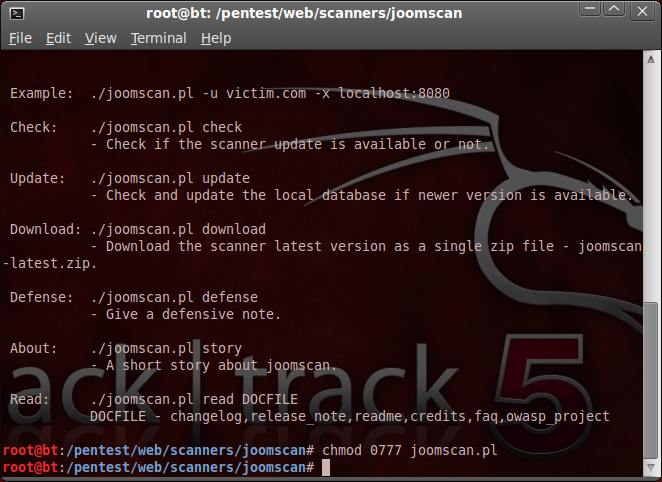 2.Now Joomla scanner console will open like in image. 3.Now console will open now type chmod 0777 joomscan.pl and hit enter. 4.Now type ./joomscan.pl -u www.YourJoomlasite.com in this in place of YourJoomalasite.com type your desired joomala site and hit enter it will start scanning it.